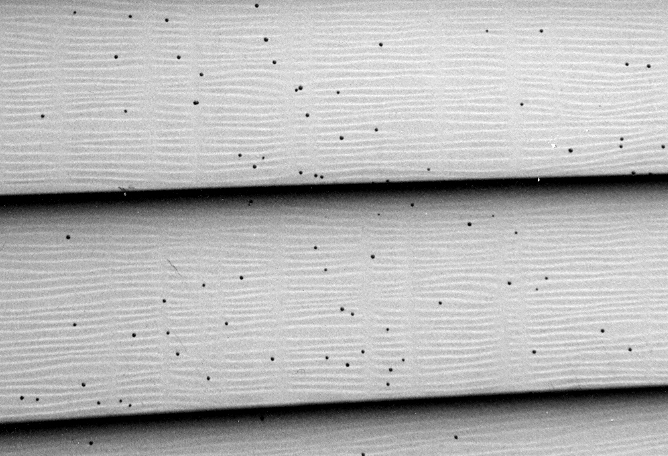 Have you seen tiny black spots on house siding, cars or plants? Small, shiny black spots that look like specks of tar are a moderately common occurrence in Iowa and the rest of the eastern U.S. Sometimes the spots are as high as 18 feet off the ground and attached to everything, though they show up best on light-colored house siding. One cause of the shiny black spots is a fungus called Sphaerobolus spp. with the common name of artillery fungus. Artillery fungus is a wood-decay fungus common in moist wood-chip mulch. The fungus forms fungal bodies very similar to cup fungi such as the birds nest fungi (http://www.mushroomexpert.com/birdsnests.html ). What makes this fungus fascinating and what gives it the common name artillery fungus, is its ability to “shoot” packs of spores as a dispersal mechanism. Black packs of spores that appear as discs (1 to 2 mm in diameter) are forcibly discharged into the air from the fungus on the wood chips. The spore packets are ejected because of the buildup of liquid that causes the cupped cells to burst and propel the spores up to 18 feet into the air. The spore packs are projected toward the light and a sticky substance ensures attachment where they land. Black spots on the leaves of plants may look like a disease, insects or their products (frass) but inspection of the mulch surface will show the real source. The spots can be a nuisance, but the good news is that these fungi won't cause any structural damage to the landing surface. However because of the sticky material the spore packs have, it is tough to scrub the spots from the surface of house siding or cars. We are not aware of any fungicide treatments to prevent the unsightly look caused by the artillery fungus. To prevent further spots, one consideration would be to replace wood chip mulch with other mulch alternatives such gravel or stone. If you like all the benefits of wood mulch, adding 3-4 cm of new mulch may help bury the fungal bodies and reduce the problem, but keep in mind the fungi may find the way up in the mulch after some time. 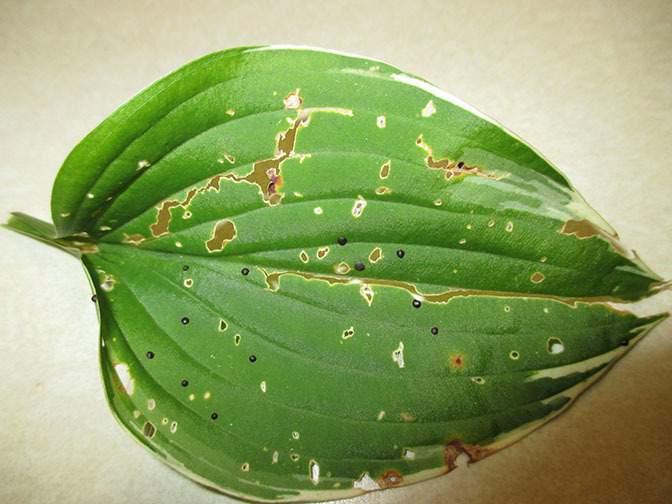 Artillery fungus spots on hosta leaf. Photo by Becky Oelkers, Cerro Gordo County Extension & Outreach Office, Iowa State University. 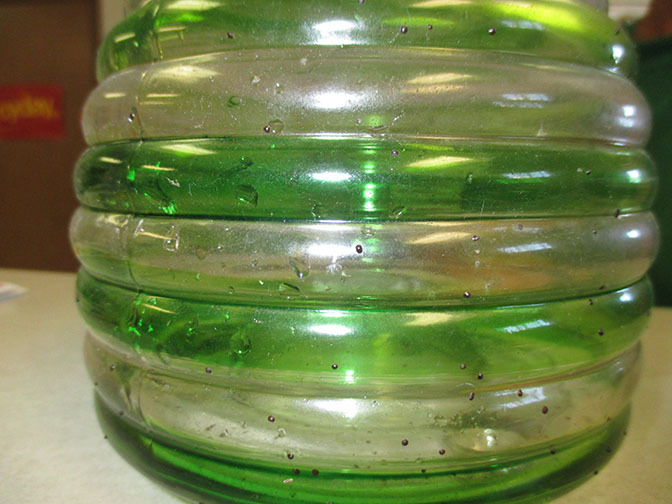 Artillery fungus spots on plastic vase. Photo by Becky Oelkers, Cerro Gordo County Extension & Outreach Office, Iowa State University. Links to this article are strongly encouraged, and this article may be republished without further permission if published as written and if credit is given to the author, Horticulture and Home Pest News, and Iowa State University Extension and Outreach. If this article is to be used in any other manner, permission from the author is required. This article was originally published on September 2, 2016. The information contained within may not be the most current and accurate depending on when it is accessed.